Do You Participate in the Box Tops Program? We are brand new to the box tops program – I never realized how easy it is to participate! This animal ring toss is a fun gross motor game with a farm theme. These sugar free gummy candies are so easy to make and are perfect for themed parties and events. This DIY money box is a perfect craft for young kids to make and then store their precious coins! These hidden train bath bombs will surprise and delight train-loving kids! Here are some of my favourite play recipes for fall for kids to enjoy! This clay art for kids is a fun process art activity that is also great fine motor practice! This conditioner playdough is made from apple-scented hair conditioner and is a lovely sensory activity! We made some summer sugar sprinkles – perfect for ice cream! These pebble plaques use salt dough as a base for this fun craft for kids! 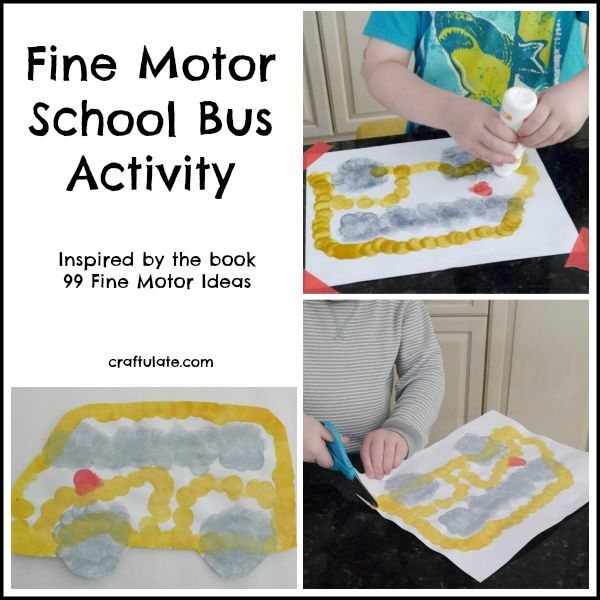 This fine motor school bus activity is a fun way to get kids ready to go back to school. This dog small world was such fun for me to put together and fun for my son to play with! This list of craft supplies for kids will get you completely ready for crafting with your little ones!